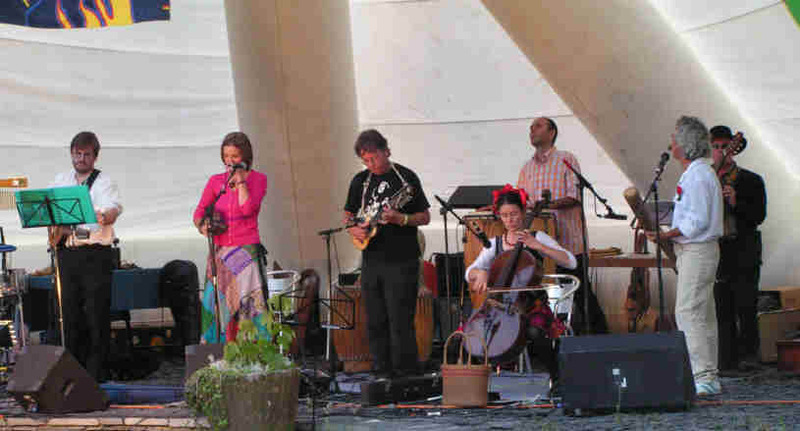 Cloud Cuckoo is a Machynlleth based band at present playing mainly lively Chilean inspired songs and melodies along with a light dusting of whimsical folk. The band draws strongly from the musical wellspring of the Chilean ‘New Song’ movement, and the inspiration of Victor Jara, Violeta Parra , Inti-Illimani and others is strongly present in their repertoire. Their distinctive and vibrant sound comes from a combination of violin, mandolin, guitar, charango, cello, congas, whistles, a percussive frog and a toy song thrush.Ringing out above it all are the excellent lead vocals of Claire Jenkins and Tony Corden. Click here for video of Cloud Cuckoo performing “La Partida”. They have recently been joined by ace trumpet player , John Cantor. 60s folk pioneers , the Incredible String Band are another strong influence. Tony was the chief organiser of the ‘El Sueno Existe’ festival in Machynlleth in July 2005. They sing songs that intertwine joys and sorrows together and that often lean in content towards a utopian dream – albeit unrealisable but important to express non the less. The band’s name refers to Aristophanes comedy; “The Birds”. The birds in this story are fed up with mankind, the earth, the Gods and heaven , so they establish a city in between the clouds. The phrase, “CloudCuckooLand” is sometimes used to imply that a project, person, or belief is naive; out of touch with the “real” world. We believe that there can be a positive connotation to “naiveté”; that it is possible to have your feet on the ground and your head in the clouds. Cloud Cuckoo are closely associated with the bi-annual “El Sueno Existe” [the dream lives] festival inspired by the life of Victor Jara which takes place in the town of Machynlleth in Mid Wales.